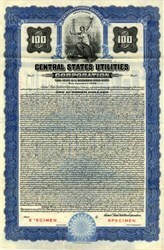 Beautifully engraved Specimen Gold Bond certificate from Central States Utilities Corporation dated 1928. 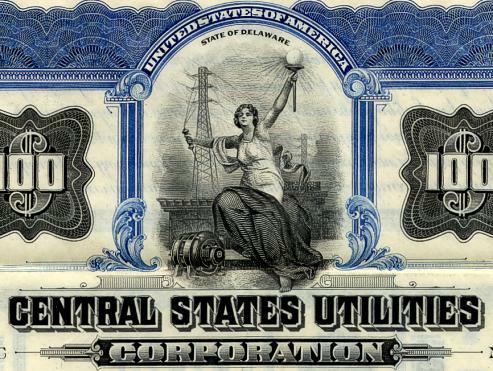 This historic document was printed by Columbian Bank Note Company and has an ornate border around it with a vignette of an allegorical woman holding powerlines and a light. This item is over 78 years old. Central States Power & Light Corporation, was asubsidiary of Central States Utilities Corporation who was a subsidiary of Utilities Power & Light Corporation.